The cost of utilities eats into a substantial part of the monthly budget. Many low income families and the elderly lie within fuel poverty. The definition of fuel poverty is when the cost of adequate heating take 10% or more of earnings. In Britain, this number grows as the price of gas and electricity continues to rise and increases in income do not keep pace with inflation. Now, more than ever, we need to find the cheapest suppliers of energy. The days of nationalised monopolies are long gone and consumers have a fairly wide choice of suppliers. Changing supply is very easy, a phone call will suffice. But first you need to find who will give you the most competitive deal. Our aim at Money Discount Centre, with the help of our data base, is to guide you to the supplier who will give you the cheapest gas and electricity. In order to compare suppliers, you need to know exactly how much you are paying for gas and electricity. Bills are fairly complex, particularly for gas as the units are converted to kilowatt hours. The first few hundred of kilowatt hours are charged at a higher rate than the following few thousand. Is this designed to make it difficult for the consumer to compare products? Perhaps. Discounts can be given if you pay by direct debit, or take both gas and electricity from one supplier. Some suppliers offer a discount on service contracts, some give rewards such as nectar points or Tesco clubcard points. If you deal with your account on line, you may also be given a discount. 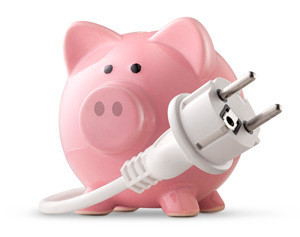 Fixed rates tariffs are available and are of benefit if you think prices are going to rise. However you are locked into the contract for a period of time and would not benefit if prices fall. As you can see, there is much to consider. Money Discount Centre is an invaluable aid and will assist you in your search for cheaper fuel. Search for your best Gas and Electricity supplier. Remember that bills can be reduced by actions taken at home. Make sure your house is well insulated and that draughts are excluded. Many people now run around the house in T shirts during the winter months. Put on an extra layer and turn down the thermostat a little. Significant savings can be made by fairly small changes. Reduce your water temperature. Why run a bath that's so hot that you need to add cold water before you can jump in? Turn off lights when you leave a room, don't leave appliances on standby. Every little helps.